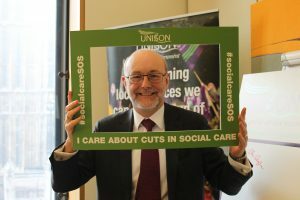 This week Alex attended a UNISON event in Parliament to show his support for a nationwide day of action as part of the UNISON campaign Save Our Local Services (SOS). Social care services are in crisis as a result of the government axing billions from council funding. Social care services that support older people aged over 65 – mainly homecare, residential care and day care services – are vital for our older people to live independent and happier lives at home and in their communities. Recent research from UNISON based on a survey of more than 1,000 social care workers across the UK showed the impact that these cuts are having. 64% of respondents said that they had found there was a higher number of patients with more intensive care needs. At the same time, 65% of the respondents said there was fewer staff and 63% of the respondents said that they had less time to spend with patients. “I was proud to sign a pledge to “call on the Government to increase funding to older people’s social care services. “As demand for services has increased, there are fewer staff, spending less time with patients. This situation cannot continue, there must be better care for older people and an end to the downward spiral in pay and terms and conditions for those working in this sector.